It can allow you to enjoy a wider range of foods, and when combined with probiotics, users report it helps alleviate symptoms of Irritable Bowel Syndrome. Multiple Enzyme Complex provides fast relief. It is ideal for you if you experience bloating or gas, follow a high protein diet, consume a lot of protein shakes, or if you are a hard gainer who has difficulty eating enough food to gain muscle. I take at least one Multiple Enzyme Complex tablet with every meal - ranging from a Quest bar, to lunch consisting of turkey and avocado, to a mixture of Muscle Provider, yogurt and nuts, to chicken and cottage cheese, and also when I eat a lot of fruit. These tablets have helped a lot. I no longer have that bloated feeling after eating. I can tell when I don't take one because I get that “full” feeling again. I would highly recommend trying these!!! And especially so if you get that bloated feeling after eating high protein meals!!! 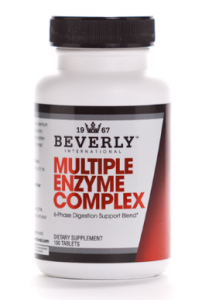 I began using Multiple Enzyme Complex because I have difficulty digesting my food and suffer from indigestion and bloating which leads to eating less than I should. Taking the Multiple Enzyme Complex allows me to digest my food more slowly and decrease the gas and bloat. Hopefully I’ll also absorb more nutrients from my food as a result. I take these daily – one with lunch and sometimes dinner. These really do help if you have issues digesting your food properly or experience gas and bloating after eating.